San Giovanni Bianco is a 1312 feet above sea level village, set in a basin overlooking the ridges of Mount Paglio and the mountain group of Cancervo (5905 feet). 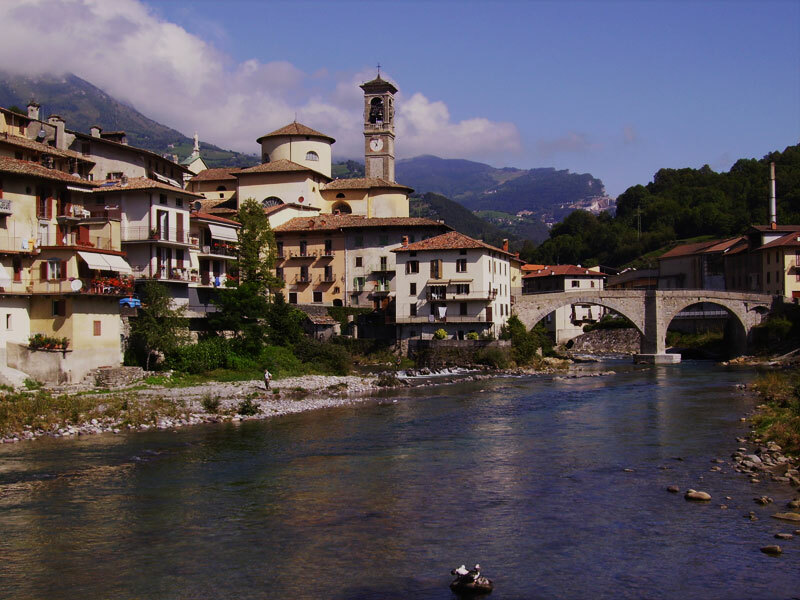 San Giovanni Bianco is one of the most important centres of Val Brembana (“Brembana Valley”) and the first human settlements are certainly of Roman origin. The Romans also integrated the village and the neighbouring hamlets in Pagus Brembanus (“Brembano Rural District”) starting from the second century BC and them again started the mining activity in the area. The settlers also provided to connect the Pagus Brembanus to the Pagus Saturnius, within the Seriana Valley which was similarly exploited as an iron mining centre. Even the name of the country emphasizes the richness of the ground: St. John is the patron of the country, but the white color refers to the common limestone formations of the territory. During the Middle Ages the mining activity continued, increased by the population growth recorded throughout the wars between Guelphs and Ghibellines. Indeed many people not involved in the fight retreated to San Giovanni Bianco, where they found peace and prosperity. The Middle Ages had been the most prosperous period in the country, as evidenced by the architectures in the historical centre and the bridges straddling the Brembo and Enna rivers. The rich families of the valley soon moved to Bergamo and Venice too, where they became influent members of the local nobility. The handcraft flourished and even though few people know it, San Giovanni Bianco is the birthplace of Italy most famous stock comic character: Harlequin, the two masters’ servant. Famous painters were also born here: Cariani in the ‘500 and Ceresa in ‘600. Another peculiarity is the Spina Christi (“Christ’s Thorn”) preserved in San Giovanni Bianco, whose adventurous and troubled tale – first revered relic, then part of the spoils of the King of France – has encouraged the flourishing of a very interesting and peculiar local tradition.